In a 2 cup measuring cup, stir together warm water, yeast, and sugar. Let stand for 10 minutes, or until foamy. In stand mixer bowl combine 2 cups of flour, salt, oil, and the yeast mixture. Add the remaining flour 1/2 cup at a time, until the dough pulls away from the sides, and forms a ball. Turn mixer on low, using the dough hook, and let mix for 5 minutes. If you don't have a stand mixer you can knead it by hand for about 5-8 minutes. Place dough in a lightly oiled bowl. Cover and let rise until doubled in volume, about 1 hour. Press dough down, and form into 16 balls of dough. Roll into round balls, and place on a lined baking sheet, about 2 inches apart. Cover and let rise for for about 40 minutes. Preheat over to 400 degrees. 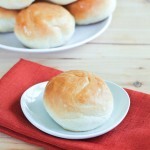 Bake rolls for 20-25 minutes. Brush with melted butter while hot, if desired.